Little Sister C is my little fashionista, she loves shopping for clothes, dressing herself & helping me review children's clothing for my blog!! I was recently introduced to KidCuteTure & we were so excited when a beautiful new dress arrived for her to wear! KidCuteTure is a fashion line created by a mother & daughter team, you will find baby flower hats, leggings, party dresses & more! The fashion at KidCuteTure is fun & functional, ranging from size 3 months all the way up to 16 years of age! The heat is on in Texas & the Angelina Dress in Ice offers the perfect summer look! We received a size 4 & it fits my daughter perfectly, it's an all around adorable dress!! This dress features a striped top, a full layered polka-dot skirt with hem assent & it's finished off with an adorable bow! The Angelina dress is made with a cotton & spandex/jersey blend & is machine washable! 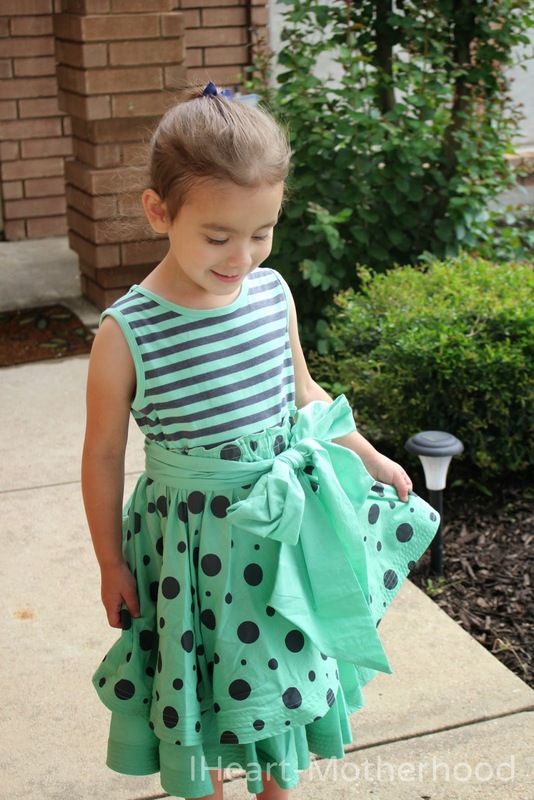 My daughter loves the look of the Angelina dress, it's super soft, comfortable & best of all - it's perfect for twirling! You can even pair it with a nice Jessy cover-up giving it a complete outfit for birthday parties & other special occasions! So what do you think? 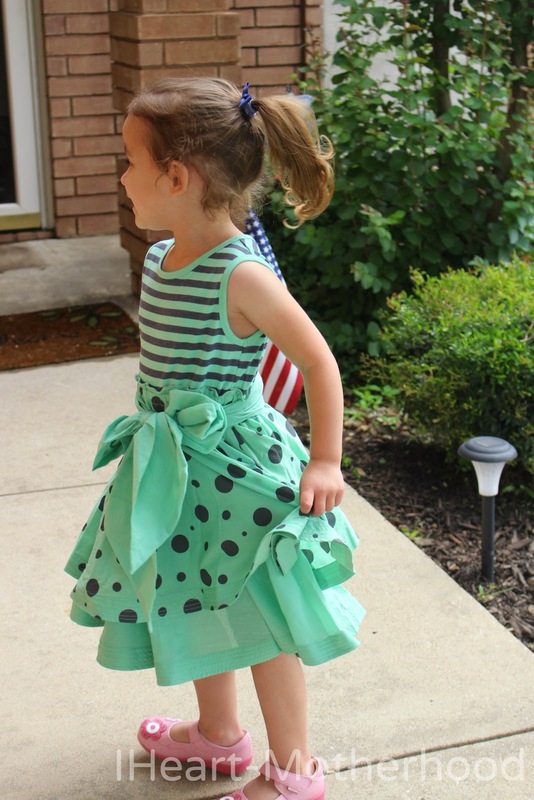 Do you have a little one who would love to have this dress?! Connect: Be sure to stay connected with KidCuteTure on Facebook, Twitter & Pinterest! Buy it: You can purchase the Angelina Dress in Ice with a jacket online at KidCuteTure! 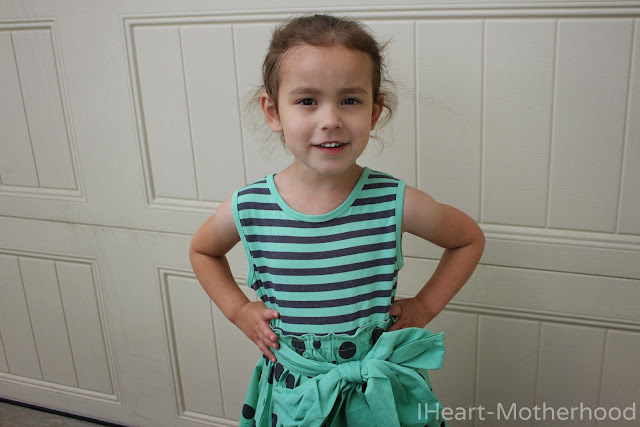 Win it: One lucky reader will win an Angelina Dress from KidCuteTure! Use the form below to enter, good luck! I love the oversized bow! This dress is just so cute! Your little girl is so pretty!